Cardiff, Wales dent repair specialists Dent Repair Cardiff announced the launch of its mobile services. The firm provides paintless dent repair using a scalable, affordable, and paint-less process that ensures the complete removal of all minor dents and dings from a car body. Cardiff, Wales dent repair specialists Dent Repair Cardiff announced the launch of its mobile dent repair service in the city. The firm specializes in paintless dent repair & return inspections on leased cars. The launch of the new service makes the company’s paintless dent removal available to a larger customer base in and around the city. The firm’s quick and effective process ensures the affordable repair and reconditioning of auto body parts with a significant reduction in turnaround time and cost. On average, the Dent Repair Cardiff process ensures that auto body dents and dings are removed in an hour’s time. Traditional body shop methods of dent repair are suited to the removal of large dents and damage to larger sections of the car’s body. As a result, such methods effort-intensive, costly, and requires a car to remain in the body shop for several days until the repairs are completed. In view of the limited scalability of these methods, Dent Repair Cardiff uses a scalable and affordable dent repair process. The company’s method relies on restoring the dented area to its original shape by working on it from the inner surface while preventing abrasions from affecting the outer body panel. The use of paintless dent removal techniques precludes the need for paint or filler material, lowering the overall cost of repair. The mobile service makes the company’s repair capabilities available to customers at their homes or places of work along with a complimentary quotation for all services. 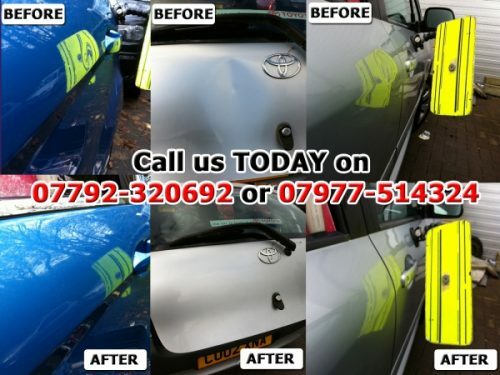 Headquartered in the city of Cardiff, Dent Repair Cardiff is a paint less dent removal specialist firm that is part of the Dent Devils network – the largest franchise of auto body repair shops in the United Kingdom. The company focuses on technical excellence, sound workmanship, and customer satisfaction. More information is available by calling 0-165-665-8195 or at the URL above.